What kind of "mommy blog" is this anyway? She barely writes about her children anymore! Were you thinking that? Oops, my bad. So here's a good story for you about Middle. Poor Middle. It's tough to be the Middle. Especially when you are the stereotypical middle child. Which he SO IS. Starting from birth, really. Colic and reflux? Yep, that was Middle. He's the child who always draws the short straw. Yet he's our go-with-the-flow one. The one who loooooves days when he can just wear his jammies and not have to go anywhere. The one who spends long lengths of time making silly faces at himself in the mirror. The artistic one. The goofy one. The airhead. He was in a standing-on-his-head phase just recently. With Eldest and Baby having such STRONG personalities, I feel like Hubby and I often tend to short-change Middle. Not crediting him enough for his smarts (which is constant); for his good behavior (which is pretty much constant); and I feel like we especially overlook his athletic abilities when comparing him to his brothers (especially in football). But this winter, Middle has grown and developed and blossomed as a basketball player. 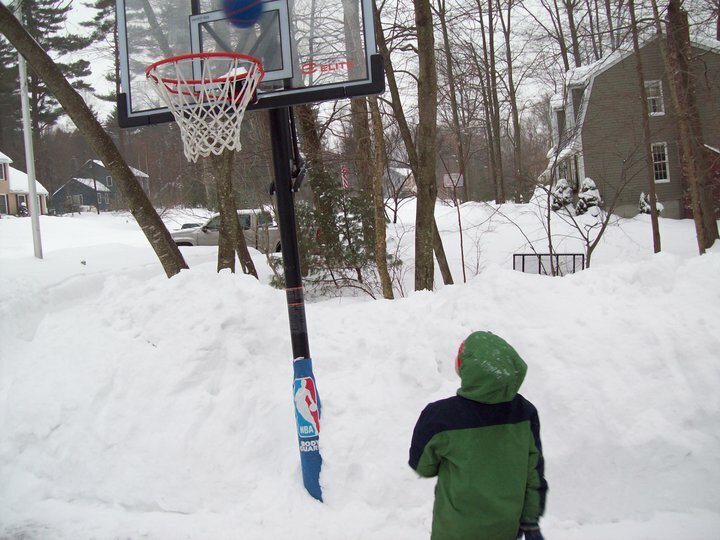 You guys, no matter what the weather, this kid spends hours outside shooting hoops. All by himself. All bundled in a winter coat and gloves. Sometimes sporting sunglasses. Hours. He and Baby played Rec League basketball this winter on the same team with all 1st and 2nd graders. Hubby and I had made the decision to let Middle play down with kids his age, instead of moving him up with an assortment of 2nd, 3rd and 4th graders. My rationale was that I wanted him to have a chance to shine. To let him be in the spotlight. To excel. Earlier that morning, Middle had informed Hubby that he was going to try to shoot a 3-pointer in his last game for a game-winning shot. Sure 'nuff, he tried for a 3, although it was early on in the game. It actually hit the rim, which was kinda impressive. And as far as the game-winning shot? Middle reached out and stole the ball with 10 seconds left and dribbled it down the court and SUNK THE SHOT as the buzzer went off. A real, true BUZZER BEATER. As soon as it happened, while both teams were congregating in the middle, Middle came over to his father and me on the bleachers and collapsed in tears. Tears of happiness. Tears of excitement. His poor little heart was beating a mile-a-minute. Neither Hubby nor I had ever seen this reaction from any of our children before. We so weren't expecting such keen emotion. It moved both of us. Again, I cannot believe we didn't get it on video. That moment was simply priceless. And this right here is why I keep coming back to read your blog everyday. You literally could have written this about my middle son,literally. I'm not a blogger but I love blogs. I love reading about others going through the same exact things as me. Totally makes me feel like I'm not in this alone, and I'm not crazy. I'm so glad you didn't give up on your blog! So sweet! I can't believe you didn't get it on video! Oh man. I don't even know Middle. But I love him. Oh, and my middle sister (and middle child) are nothing like your middle. So maybe it's a girl thing? Tears were streaming down my face as I read this. Yeah Middle! He is awesome. What a great story...love it...every bit of it! That is so sweet! I wasn't expecting that part. I was teary-eyed after reading it.